Let’s continue to make history! It has been 73 years since Congress declared the first week in October as the time to officially recognize employees with disabilities, and 29 years since Congress officially declared the month of October as National Disability Employment Awareness Month. The Nation’s commitment to celebrating individuals with disabilities has remained strong from 1945 to this day. The National Institutes of Health (NIH) embraces that commitment and has provided resources and unique programming and services to further recruit, retain, and advance employees with disabilities. 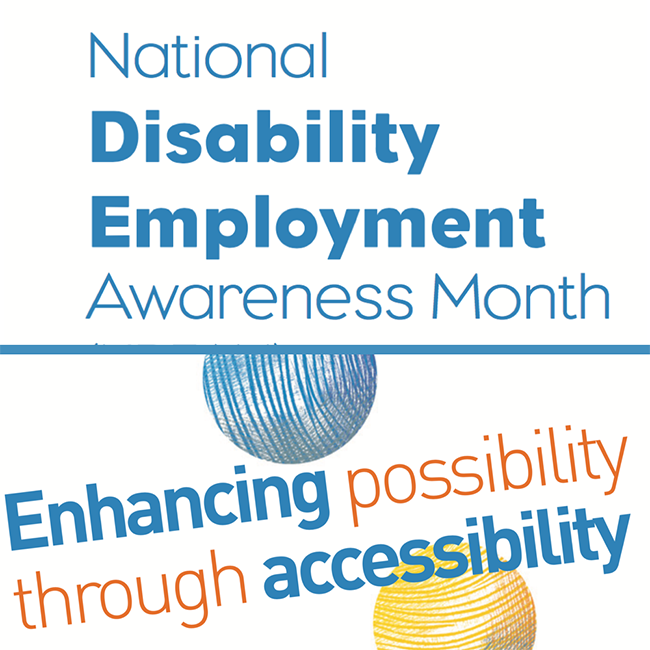 This October, EDI celebrated National Disability Employment Awareness Month (NDEAM) by providing several dynamic activities and showcases through the theme of "Enhancing possibility through accessibility." Managed by the Office of Equity, Diversity, and Inclusion (EDI), EDI has developed a unique Accessibility Consultancy model, where they provide three very useful accessibility services to the NIH community: Reasonable Accommodation, EEO Guidance, and Language Access. The NIH Reasonable Accommodation Program (RAP) is history-making, given it is the first of its kind at the NIH. Although currently in a soft-launch, EDI has committed to collaborating with the NIH Disability Program Manager and NIH Disability Employee Resource Groups to learn more effective ways to meet the needs of the disability community. Moreover, EDI developed an in-house Accessibility Intake Center where employees can test the latest accessibility equipment and software technology. The Accessibility Consultancy has also developed—via its Language Access service—a Language Access Services: Translation and Interpretation contract by which ICs may have their printed materials translated into languages other than English. Finally, EDI’s Accessibility Consultancy will continue to offer EEO Guidance via its "Dear Guidance" resource service. There, employees may ask EEO related questions and make comments. Taken together, join EDI to continue to make history at the NIH!